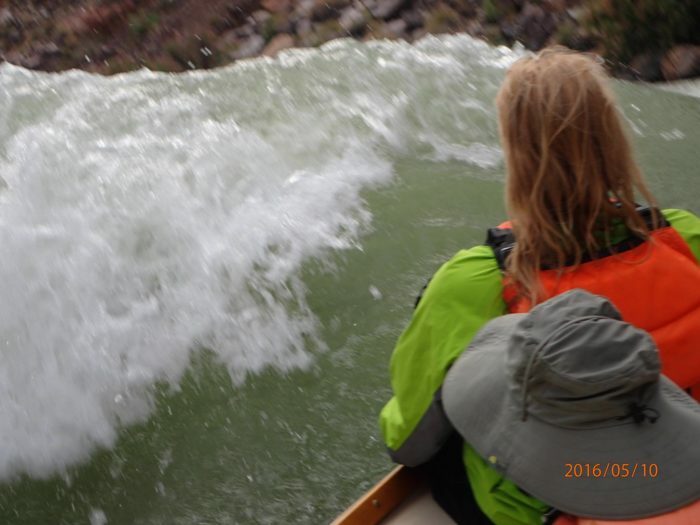 In May 2016 after 14 months of happy anticipation, I did a 16-day dory trip on the Grand Canyon with OARS. More than a year earlier, my mother passed away after 7 years of Alzheimers and lifetime of PTSD from Nazi Germany. Weathering that chapter and the economic aftermath of 2008, I hadn’t had a vacation in years. My bones and my soul needed deep recharge. There were some modest options to consider. Do I return to Europe for a long-overdue trip to see my German family? Do I finally make my literary pilgrimage to the restored Globe Theatre in London? Do I go on a trip west for sand in my teeth and salt on my skin? Where can I feel small again and find my place in the world? Feeling small meant some real outside time. My late husband and I spent meaningful time outside climbing, cycling, and wandering. I was bone-tired from taking care of everything for many years, and had ended a relationship. How could I do something meaningful while not in charge? Remembering my life list, the Grand Canyon immediately emerged. “You HAVE to do a dory trip,” advised my good friend from Colorado Outward Bound. The next day his email had a list of books from the Emerald Mile, Desert Solitaire, Cadillac Desert, The Secret Knowledge of Water, and appropriately, Down The Great Unknown by John Wesley Powell. My angle of repose would be in a dory. I called OARS, gulped, and paid the deposit. After all the plans, house-watching arrangements, and an updated will (I am German after all! ), I drove to friends in Durango before the last leg to Flagstaff and the pre-trip briefing meeting. I dropped into the trip not knowing anyone. A few people had been on river trips, most of us had not, and looked at each other the evening before our van ride to the Lee’s Ferry put in. The river was gentle to the newbies the first day, and we were briefed about rapids, bailing, and righting a dory through rapids. While each day had its routine of meals and logistics, music around the campfire, and a reading from the same location of the Powell expedition, the canyon and our guides revealed new wonders. The May waters were clean of mud, so cool and refreshing, and the sun warm. This night owl was up at 5 and fast asleep well before 10 under the stars…thankfully free of scorpions. Weird as it sounds, our downtime on river beaches meant joyful swims under each other’s watch as each hour soaked into my soul. Day 11, the hike to scope Lava Falls was hot and the barrel cactus along the trail meant business. We knew how to ride, bail, whoop, set up and take down camp each day, and admire our skillful guides. The churning water did look big, but even after the dozens of rapids to that point, the river wasn’t the same from there as in the middle of the action. Even with significant expertise, the unexpected can happen, and we had to be prepared. Ours was the third to drop in. The moment the right gunwale swooped up too high to stand and high side, I was flipped out of the back bench of the dory from right to left. Time slowed down in a big hurry. My head popped up and I was inside the footwell of our overturned dory. I quickly oriented my hands to a gunwale to push away the dory and gulp air before the next wave came down. The helmet and life jacket collar were perfectly designed to float and keep my face up. My mind and body did all the right things and went with the 9600 cfs flow. Feet pointed downstream, there was no swimming across the current even when the shore looked so close. The second dory mates pulled me in just before the Little Lava descent. Thankfully they knew my four mates were okay. We watched the three cargo rafts deftly descend Lava from an eddy, and not far downstream, alighted on a beach for the night much earlier than our usual stop. I never felt that much adrenaline, nor such a focus. If there was any doubt about the fire in my belly, the river washed it away. At dinner, my coffee mug was filled with wine by my buddies, and each of us listened to each other’s stories during an evening circle filled with gratitude. It was a textbook recovery. There were a few bangs and bruises. Our individual resilience and group fortitude aligned so beautifully. I’d head down the river again with these friends and would humbly work for the guides. The adrenaline faded but every day was that much more amazing. We arrived at clean camps and left the way we found them. Leave No Trace. This is deeply important. My body and mind were reacquainted with the sore dull-headed place I appreciated Monday mornings so many years ago after weekends outside. It was a strange transition back to reality after 16 days outside, day and night. Meeting friends at dinner in Flagstaff must have thought I emerged from a cave. My feral self wasn’t yet ready for home. The quiet North Rim was a relief. At night it froze at 60F colder after the 95F highs at Lake Mead. There is so much more inside each day of this journey. Each of us had our own reason to be there and emerge with something new. River culture reminds me of climbing. Lots of storytelling, gear, repairs, critical safety. There is a respectful intimacy with the power of the natural world. Horizontal travel is as serious as vertical. The Grand Canyon is undeniably transformative. It will not let you lie to yourself; if you do, there are serious consequences. Far from a selfish experience, this time and place solidified a deeply human need to be outside. It recentered my body and soul. Silence about our public lands isn’t possible. A gift like this must be shared and cherished. Our American heritage, our national DNA, our legacy to new generations must include these national treasures. Time is the critical currency to understand the impact of these gifts…an afternoon, a day, a weekend…whatever you can afford will be and won’t be enough. Our rivers are indeed our lifeblood, the land our bones, it’s all soul food.